Bargain hunter husband came home with a huge piece of swordfish for less than $3! 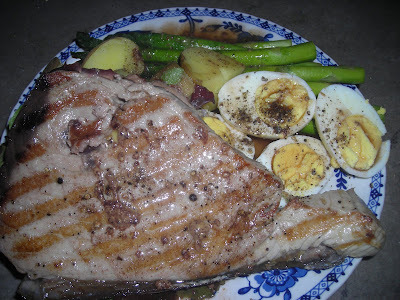 So I went to my "go to" recipe for swordfish. From The Barefoot Contessa. It's easy and one of those recipes that you usually have all the ingredients on hand. With the exception of the fennel, which is often hard to find on the prairie. I added a good pour of Pernod along with the wine. A satisfactory substitution I thought. With a first course salad of mixed baby greens with the last little bit of cauliflower, some green pepper and red tomatoes with a mustardy vinaigrette, it was a great meal. Husband Jim was very pleased with himself and his bargain.! For the sauce, cook the onions and fennel in the oil in a large saute pan on medium-low heat for 10 minutes, until the vegetables are soft. Add the garlic and cook for 30 seconds. Add the drained tomatoes, smashing them in the pan with a fork, plus the salt and pepper. Simmer on low heat for 15 minutes. Add the chicken stock and white wine and simmer for an additional 10 minutes to reduce the liquid. Add the basil, capers, and butter and cook for 1 minute more. Prepare a grill with hot coals. Brush the swordfish with olive oil, and sprinkle with salt and pepper. Grill on high heat for 5 minutes on each side until the center is no longer raw. Do not overcook. 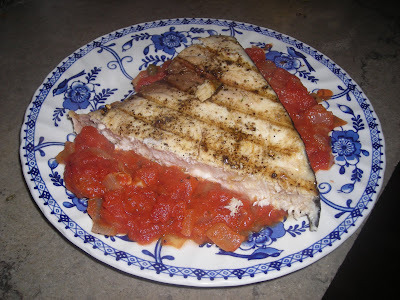 Place the sauce on a plate, arrange the swordfish on top, and garnish with basil leaves. Serve hot or at room temperature. NOTE: I added about 2 T. Pernod when I added the wine for I didn't have the fennel. 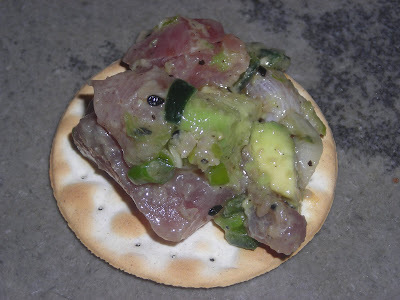 Has to be the easiest appetizer ever. Hardly anything made, all purchased and just composed. A great variety as well so guests have a choice. 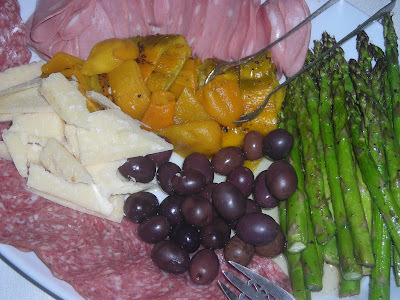 Even in my little town on the prairie, I was able to find "good" olives, real Italian salami and mortadella. 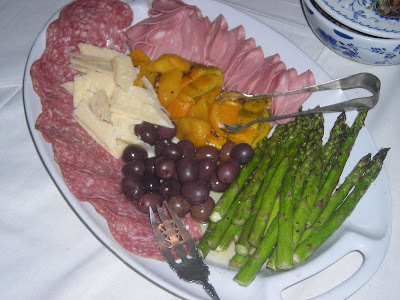 My only "cooking" was the asparagus which I roasted early in the day and then sprinkled with a balsamic vinaigrette before placing on the platter. With peppers from a jar and big hunks of Parmesan (which I sprinkled with a 15 year Balsamic vinegar), it was a great appetizer. The leftovers? What little that was left made a great frittata the next morning. topped off with a shower of Parmesan. My morning coffee, midmorning or afternoon tea are always taken from a cup or saucer. Husband Jim, however, prefers a mug. The mugs in my cupboards were white which went with everything but I have a love of blue and white and at Tuesday Morning I found these stunning mugs. 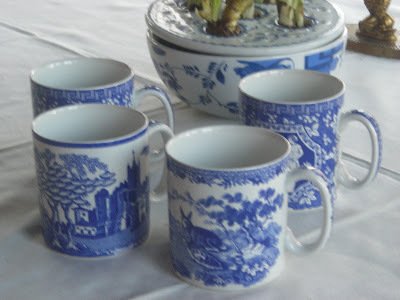 They go well with the blue and whie breakfast china and I like the look and feel of these mugs. My mug use is for hot cocoa only and the last couple of evenings on the prairie have been both cold and snowy and icy. Perfect for that cup of hot cocoa with marshmallows floating on top. I'll also use them for cream soup -- nothing like a mug of soup (often tomato) and a grilled cheese sandwhich for a winter luncheon. Husband Jim is happy with his new breakfast coffee mugs and I'm happy with the addition to my blue and white collection. or Pork Roast with Oranges from the From a French Country Kitchen (The Culinary Tradition of Le Madeleine French Bakery and Cafe). I've had the cookbook "forever" and enjoyed reading it but had never cooked from it. 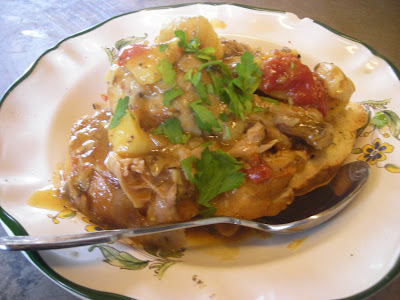 Inspired by our trip to Dallas and a must do dinner at Le Madeleine to fix this pork recipe. With Christmas oranges and a piece of pork loin in the freezer, it seemed a natural. 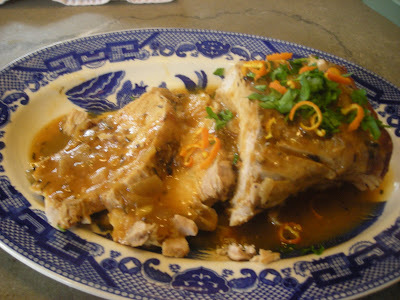 The orange gives a refreshing flavor to the sauce and Husband Jim rated it as one of the best. The book recommends serving it with zucchini salad with mushrooms and white onion puree. I served it with a regular salad of mixed baby greens, red onion slices, grape tomatoes, green pepper stripes and a red wine vinaigrette as well as tiny zucchini sauteed in a bit of olive oil with salt and pepper. I'll definitely do this again, even if I don't have Christmas oranges. Brown pork roast over medium heat in unsalted butter in a large casserole. In the same pan, brown onions and sliced oranges. Add water or stock and tomato sauce to the pan. Add thyme, bay leaf, sugar, salt and pepper. Cook, covered over low heat for 1 hour or until roast reads 170 degrees. Check periodically, adding water or stock if dry. Turn roast several times during cooking. Remove cooked roast to a platter and cover loosely with foil. If sauce is too thin, add, in small pieces, 1 tablespoon of butter and 1 tablespoon of flour, kneaded together until desired consistency is obtained. Cook for a few more minutes, stirring constantly with a wooden spoon. 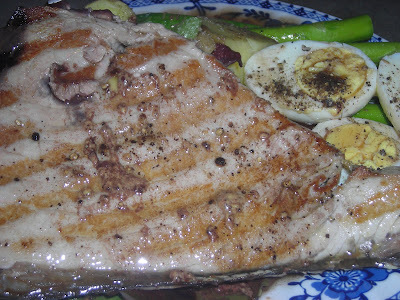 To serve, slice pork roast and arrange slices on a hot serving tray. Pour a little of the sauce over the roast. Garnish the edge of the platter with half slices of oranges, poached 1 minute in the sauce, and some green leaves and fresh thyme springs. Pour the remainder of sauce in a gravy boat and serve with the roast. We celebrated Daughter Sarah's birthday last Friday and there is nothing better to celebrate birthdays with than a chocolate cake. 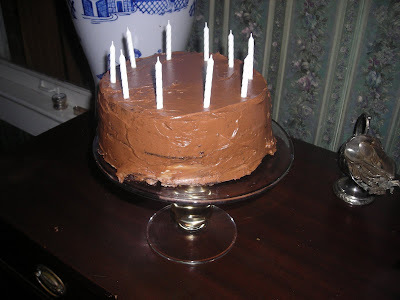 She's way past the 10 candles on the cake and once attaining the age of 18, we stop putting a candle on for each year. Except for those special birthdays of 30, 40, 50 and up! Surprisingly, Daughter Sarah does not have a favorite cake although she does have favorite desserts -- tiramisou is one -- cheesecake another. But chocolate cake is good and goes so well with ice cream (vanilla bean, please). 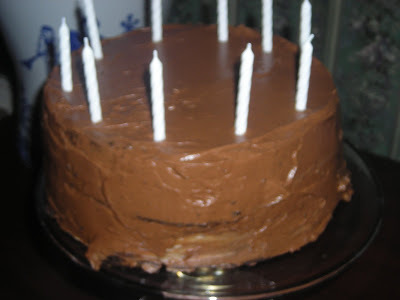 And this chocolate cake recipe is great! Another recipe from the Barefoot Contessa, this one from Barefoot Contessa At Home. It's called Beatty's Chocolate Cake. One of those recipes that's given a name and as it is passed from one to another the name sticks. 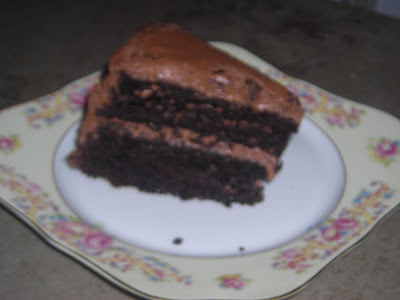 Whatever it is called, it is one great chocolate cake. Preheat the oven to 350 degrees. Butter two 8-inch round cake pans. Line with parchment paper, the butter and flour the pans. 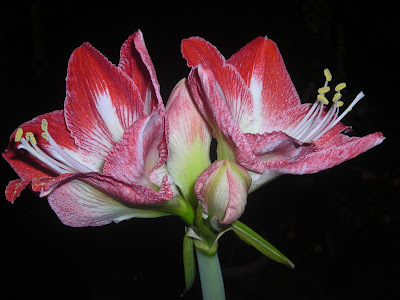 Every year I get a couple of amaryllis to force for Christmas bloom. There is something about red blooms in the house in December (whether poinsettias or amaryllis) that just make the house seem more Christmassy. 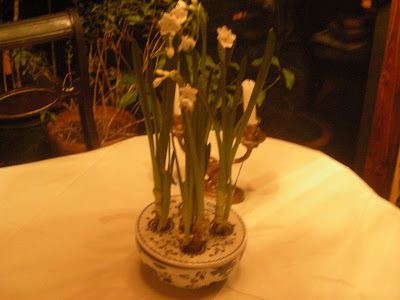 This year, it was Wal Mart bulbs -- one grew and one didn't. The sole survivor seemed to grow slower than usual, finally budded and stayed in bud forever. Christmas came and went without any bloom. Coming back from the cruise, it had opened up -- as if to greet me and to say that although it is winter on the prairie, spring is on it's way. 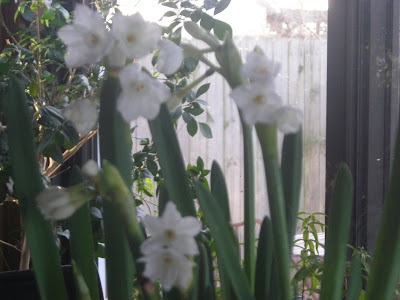 In January, there is nothing like something in bloom to make you forget winter. This amayrillis is doing that job splendidly. 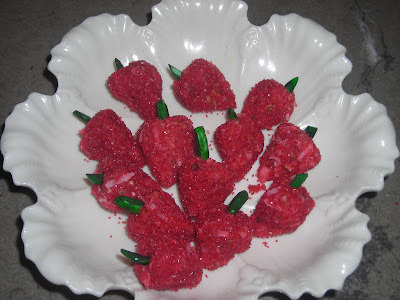 A wonderful sweet treat, these strawberries made from J-ello, pecans, coconut, shaped like strawberries and rolled in red sugar. A food colored slivered of almond stuck in the top. They make a great Christmas candy but also are a delight on a tray of tea goodies. My friend Shirley Ann first made these and gave me the recipe. It was long long ago for I've had the recipe "forever" -- it even predates daughter Sarah! At Linderhof, it's not Christmas nor am I having a tea but rather I made these as decoration for a strawberry cake that is to be served at my sorority event this evening. I think it shall be pretty, each piece of pink strawberry filled cake topped with one of these strawberries. I call the recipe Shirley's strawberries although I'm sure the real name must be J-ello strawberries. One of those recipes thought up by the company that makes the product as another way to use their product. 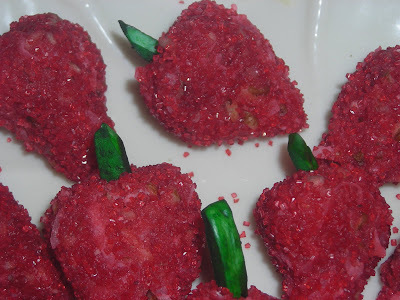 But it is a good recipe and a fun confection both to make and to eat. Add all the above ingredients together (except for the red sugar and almonds) and chill for 1 hour or overnight. Sliced almonds, add green food coloring to these until you get color of green you want. Take strawberry mix and shape with hand looking like a red strawberry. Next roll in red sugar until coated. Stick green almonds for steam. Keep in refrigerator will last a week in refrigerator. Bouillabaisse is a classic dish made with fish and seafood. Seafood is not native to the prairie and I was so happy to find a chicken bouillabaisse recipe. With chicken legs and thighs from the freezer, it made a warming dinner on a cool but not cold January night. It's easy and it's a one dish meal -- something that I always like. One of the key ingredients of bouillabaisse (whether seafood or chicken) is saffron. Saffron is expensive, you use but a little bit at a time for it is extremely rare and takes many crocus plants to make an ounce of saffron. 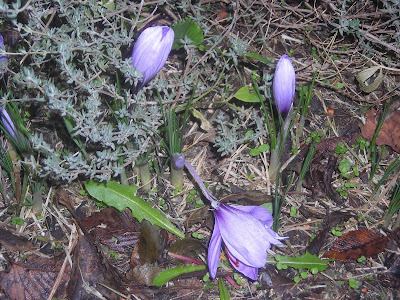 Saffron crocus bloom in the garden at Linderhof. A fall bloomer, they do brighten dreary fall days. Planted long ago, they have survived other things planted around them (for I often forget they are there) and we even had the garden plowed once and still they came up and bloomed. 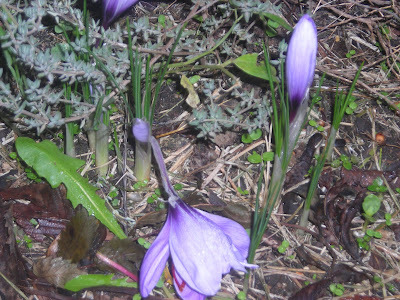 Even though we do have saffron crocus in the garden, we don't even have enough to make a decent pinch. But it's fun to grow them. Just as it is fun to eat chicken bouillabaisse! The recipe from Ina Garten and it is a winner. A good use for the thighs and legs that accompany chicken breasts. Pat the chicken dry with paper towels and season it generously with salt, pepper, and the rosemary. Heat 2 tablespoons of olive oil over medium heat in a large Dutch oven and brown the chicken pieces in batches until nicely browned all over, about 5 to 7 minutes per batch. Transfer the browned chicken pieces to a plate and set aside. Lower the heat to medium-low and add the garlic, saffron, fennel seeds, tomato puree, chicken stock, white wine, Pernod, 2 teaspoons salt, and 1 teaspoon of pepper to the pot. Stir and scrape up any browned bits on the bottom, and simmer for 30 to 40 minutes, until the garlic is very tender, stirring occasionally. Meanwhile, preheat the oven to 300 degrees F.
Carefully pour the sauce into the bowl of a food processor fitted with the steel blade. Puree until smooth. 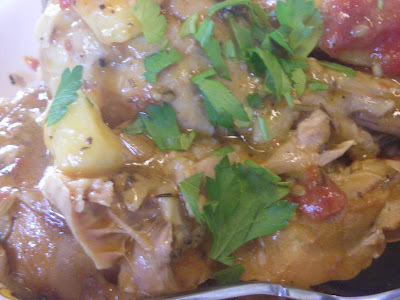 Return the sauce to the Dutch oven and add the sliced potatoes and browned chicken pieces with their juices. Stir carefully. Cover the pot and bake for 45 to 55 minutes, until the potatoes are tender and the chicken is done. Check the seasonings and serve hot in shallow bowls with big dollops of Rouille and slices of crusty bread. Place the garlic and salt on a cutting board and mince together. Transfer the mixture to a food processor fitted with the steel blade. Add the egg yolk, lemon juice, saffron, and red pepper flakes. Process until smooth. With the machine running, pour the olive oil in a thin, steady stream through the feed tube to make a thick mayonnaise emulsion. Transfer the rouille to a serving bowl and store it in the refrigerator until ready to serve. Earlier this month, we left for a vacation -- something that we've not had in a long time. A cruise vacation on the Carnival Ship, Ecstacy. Five nights of living in luxury, being waited on hand and foot. We drove and took our time getting to the port of Galveston where we boarded the ship -- a leisurely way to start a leisurely vacation. We cheated winter as well for while temperatures on the prairie were at 2 degrees we were basking in warm sun. We visited Progresso, Mexico and their sunny beach and warm ocean. A nice way to spend a lazy day. We also traveled inland to Merida -- a very large city and felt that we had a chance to see real Mexico -- not the tourist areas that the ships seem to go to. An old town, it was a rainy day while we were there. The Governor's Mansion as well as the centuries old cathedral are two reasons to venture inland to Merida. We lunched there on tacos and beer in a quaint restaurant before we headed back to the ship and back to sea. January has slipped past us while we were gone but we did have a good time. Now, today, the mounds of laundry need to be done, the parched plants watered, the inch thick layer of dust needs to be attended to. But first dog and mail need to be gathered. 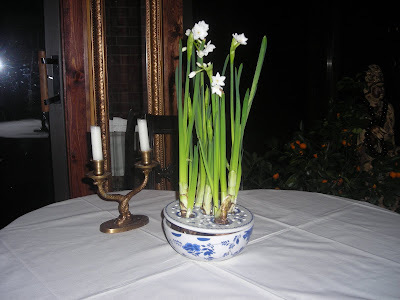 Guests coming for luncheon and on a sunny winter day what better than paperwhites almost blooming in a blue and white vase, the table set with blue and white china. 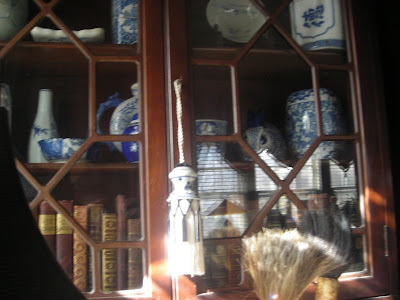 I have a love affair with blue and white whether it is new blue and white from Hobby Lobby or ancient blue and white from China or Japan. And of course, I also have a love affair with blue and white dishes -- because they go withe verything! 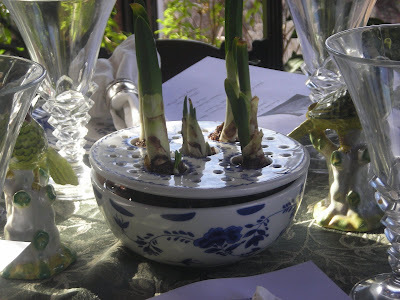 And I love to mix Dutch, English and Asian pieces all on the same table. 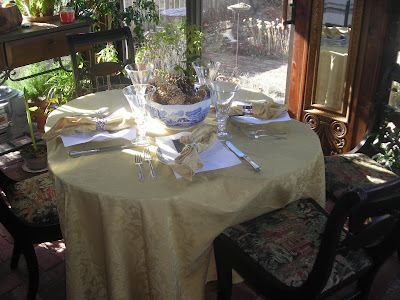 To complete the centerpiece, two birds "flew" in. Not blue and white but just the added touch needed to finish off the table. 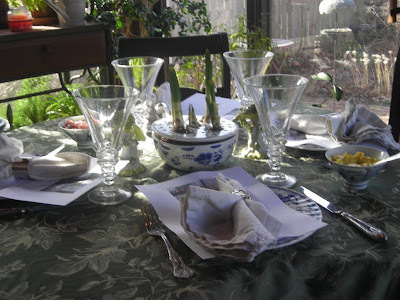 I've always felt that the food is important for a meal but the table setting is to. As food is pleasing to the stomach so should the table be pleasing to the eye. Although mincemeat is thought of as a Christmas treat, we like it all through winter. I didn't grow up with a mother who made mincemeat -- no, our mincemeat always came from the store -- made by the supermarket. You can't find that mincemeat anymore so we have to rely on Nonesuch. But it is a good product and several jars always find there way to the pantry at Linderhof. 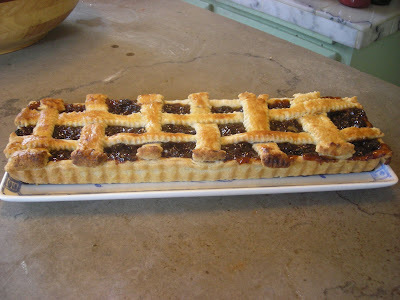 For a luncheon recently, the mincemeat tart seemed the perfect dessert. And an easy dessert. My favorite crust easily made in the food processor and then to make the tart a little bit more of my own, I added the grated peel of one orange to the jar of mincemeat. 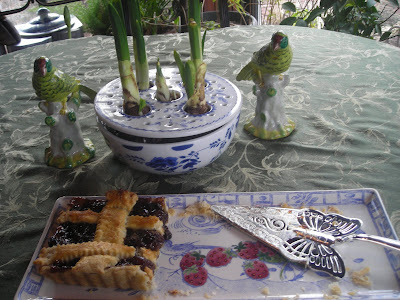 It was a good tart and there was even enough left for husband Jim and I to have the last two pieces for dinner dessert. Place the flour, salt and sugar in the bowl of a food processor fitted with the steel blade. Pulse for a few seconds to combine. Add the butter and pulse 10 to 12 times until the butter is in small bits the size of peas. With the motor running, pour the ice water down the feed tube and pulse just until the dough starts to come together. Dump onto a floured board and knead quickly into a ball. Wrap in plastic wrap and refrigerate for at least 1 hour. Mix together. Pour into tart shell. (I used my rectangular tart pan but a round one would work as well). 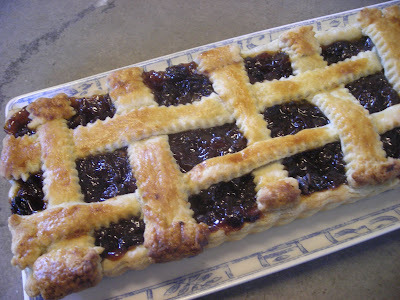 You can make lattice on top with the extra pastry -- adds a nice touch. Brush with egg wash. Bake at 400 until the pastry is browned and the filling bubbly. It's not really a room -- more of an alcove/closet off the bedroom. It IS where I hang my clothes and it is where I do my lotions and potions every morning and night. It does have French doors which can be closed, thus making it a closet. I prefer, however, to leave them open for the window brings in more light and being able to see that additional three or four feet makes our large bedroom even larger. The items on the dressing table are memories all -- a Lenox swan from my first boss, a crystal oyster with pearl -- a gift from dear friend Shirley Ann as a memento of a trip to New Orleans and the oysters we ate, a sterling hair brush, mirror and comb -- a gift from my maiden aunt, a small bronze dressing table clock -- a gift from husband Jim. 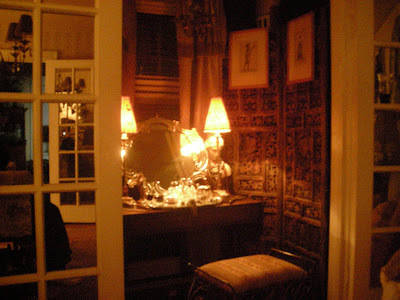 Waterford perfume bottles and Venetian mirror bring sparkle to the space. 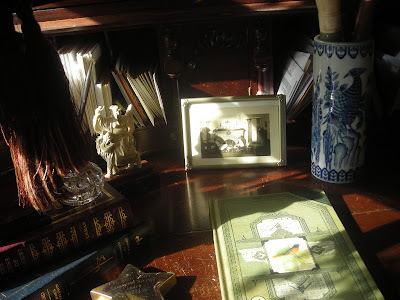 Jewelry is kept in an oriental box and necklaces around the bust on the dressing table. It's the place where I start my day and where I end my day -- surrounded by love. 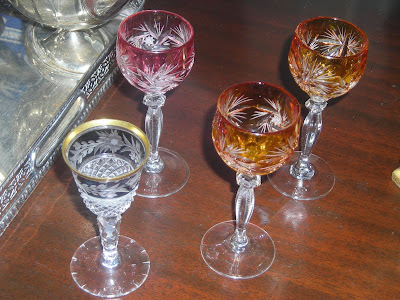 From husband Jim were four cordial glasses to go with my collection. I have about 20 or so now and haven't bought any new ones in "forever". I like singles with no two exactly alike -- it's fun to serve after dinner drinks from them. Little sips of something almost syrupy sweet. 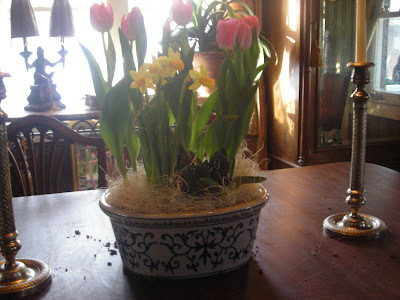 It is fun, when one goes to antique stores or flea markets, to see what one can find. My favorites, and the ones that I have the most of, are like the three -- the rounded bowl of colored glass which has been cut into revealing clear glass. Many of mine came from an antique store in Wichita, Kansas. I would buy another each time we visited Wichita and a stop at that antique store was a must! All of these came from our trip to Minneapolis and surprisingly all were fairly inexpensive, at least according to my gift giving husband. Perhaps the best cordial to sip out of them is my own homemade ones -- peach, apricot or orange. We love to have company especially for a luncheon and right before the end of 2008, three friends joined me for lunch. 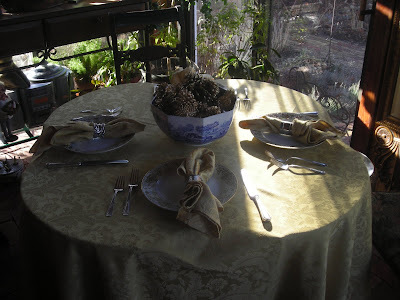 The Christmas decorations were still up and so the centerpiece was one of my blue and white bowls filled with golden pinecones. I collect white and gold china and these plates (part of a set of 8) have what looks to me like Christmas balls around the edges so I often use them at Christmas thinking of them as "bonus" Christmas china! 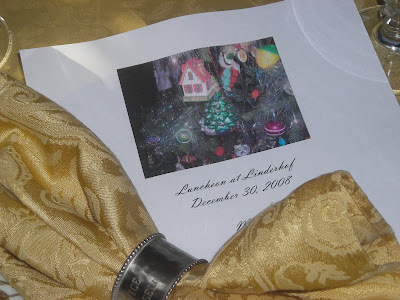 At every place, whenever we entertain, be it for dinner or a luncheon, is always a menu -- since this is a holiday luncheon, the picture is of the ornaments on our tree. The napkins are always in one of our collection of silver napkin rings -- all have names or initials engraved on them. 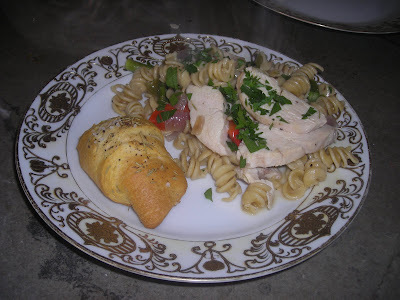 After a salad of greens, dried cherries, roasted pecans, and sliced apples with a maple vinaigrette, the entree of Christmas pasta with chicken and a roll topped with rosemary, salt and pepper. I love the Christmas pasta because with the red peppers and red onion and green pepper and asparagus it has the colors of the season. With chunks of chicken added, it's a main course. 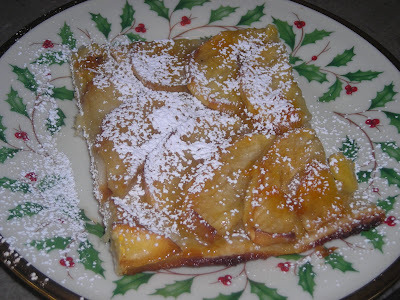 Dessert was a favorite apple tart -- from Ina Garten and THE BEST -- no cinnamon or nutmeg here -- just apples and sugar and butter baked on a thin crust and then brushed with apricot jam thinned with Calvados. The Lennox Christmas dessert plates are a fitting carrier for the tart. 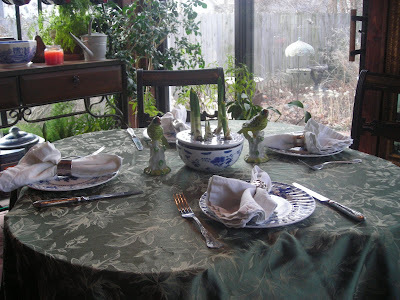 We love to have luncheons in the breakfast room overlooking the garden although in winter, the garden looks bleak unless it is snow covered. Alas, no snow this Christmas, but a good show by the bird friends of Linderhof kept us entertained through lunch. 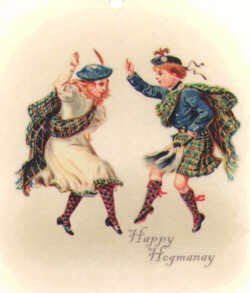 And days o' lang syne ?